Drawing can be fun. It's sometimes silly how we have preconceived notions on what a good or a bad drawing is. 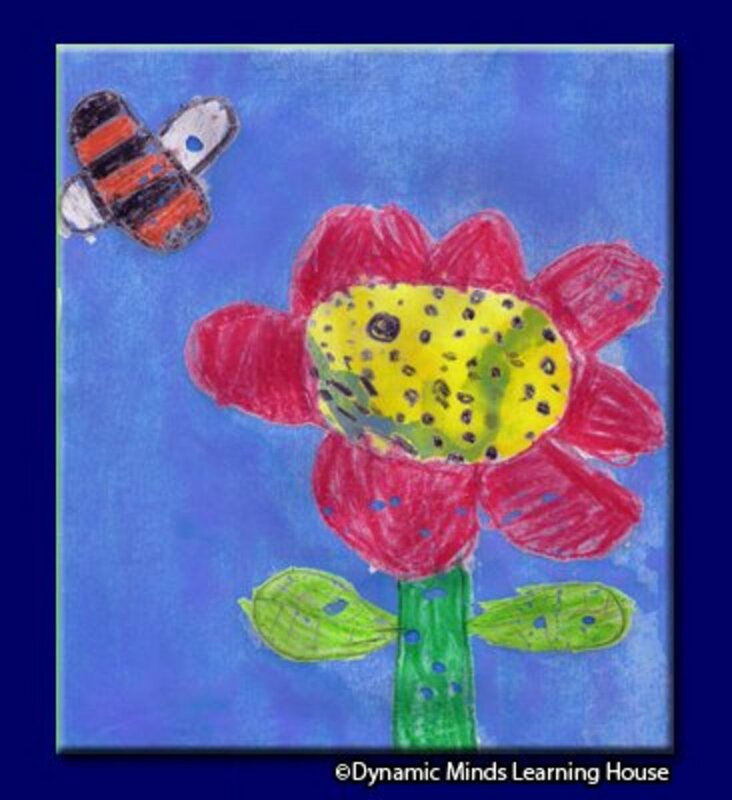 I believe that children should be allowed to use art as a form of expression. In our preschool, I noticed that many kids like to draw anything and everything. If we want them to settle down, we would give them blank papers, pencils and crayons and drawing becomes one of their favorite activities. That is what I call creative expression! But for kids who want to learn how make specific figures already; you have to show them that drawing is made up of several parts joined together. “I don’t know how to draw!” Well, I don’t know either. 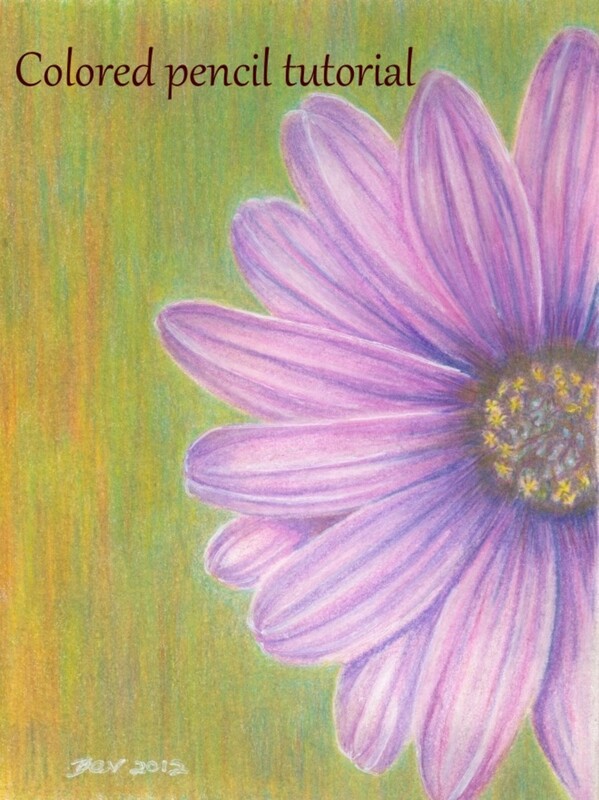 I’m not an artist but every so often I do like to dabble with drawing or painting. 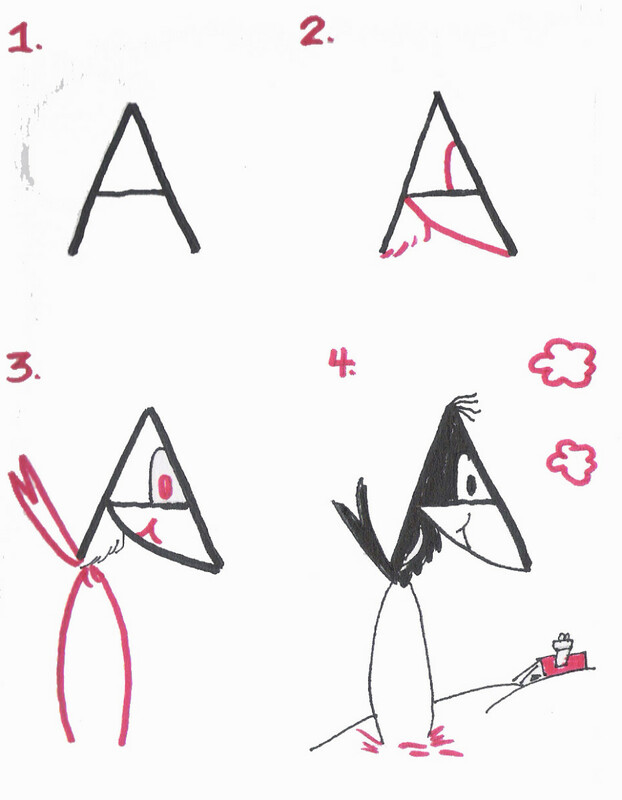 For those who are clueless on where to start, here are some drawings that are so simple that anyone can really give it a try. 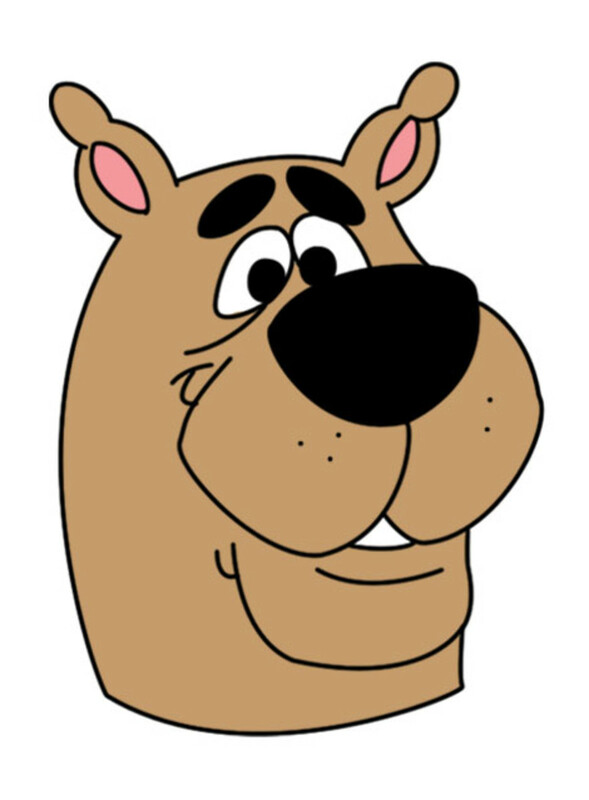 Once you know how, it’ll be so easy to teach your kids or students some basic cartoon figures. If I was able to do this, then you can too. Grab a pencil and start drawing! Younger children can start off by drawing stick figures. 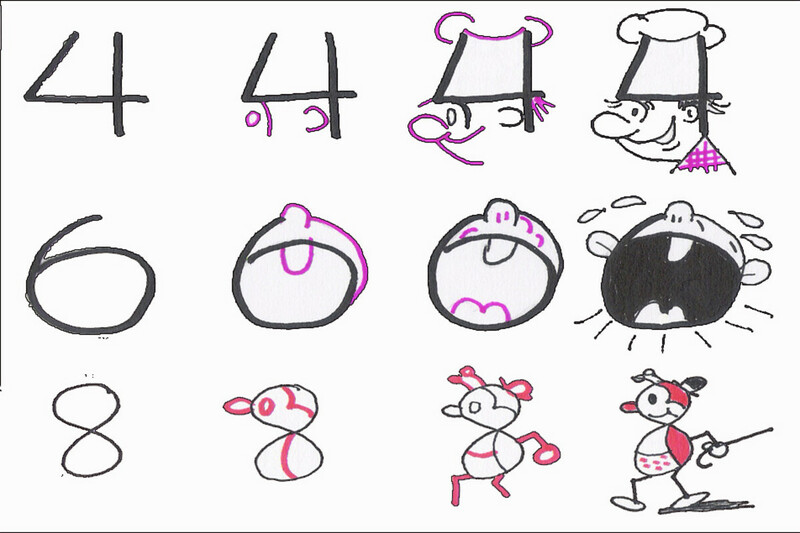 In the above drawings, you can draw a lollipop by adding lines or circles. I see a man running. But what about the second man? What is he doing? Why are his arms wide open? 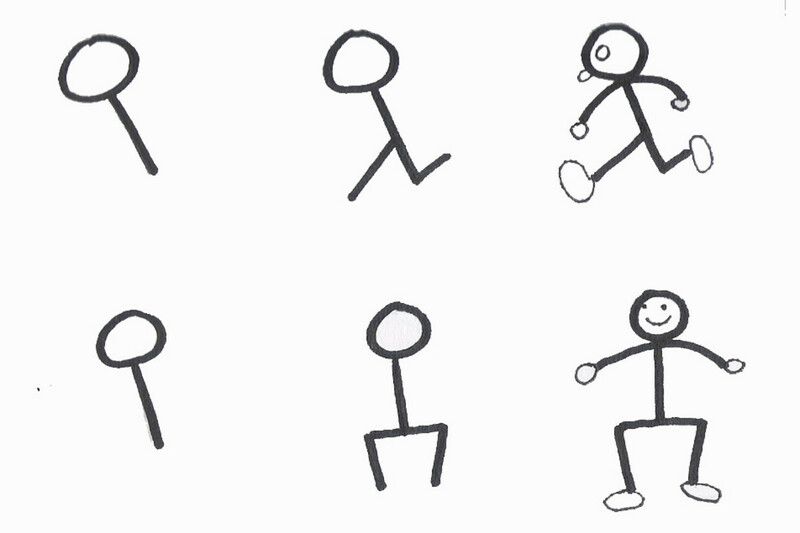 You can make lots of stick figures. You can draw girl stick figures too by adding clothes. 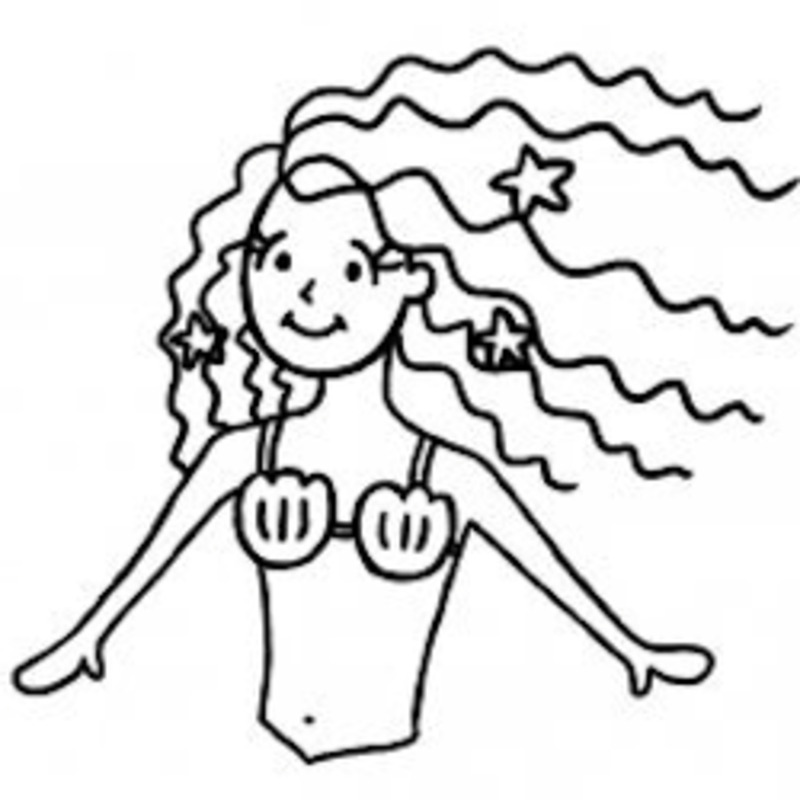 Or you can draw stick figures with hair or make them raise their hands, bend their body and more. 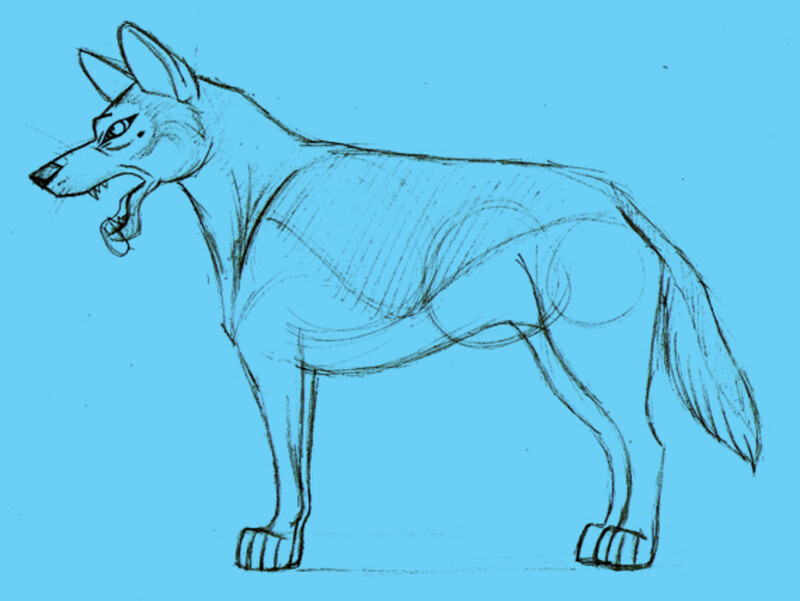 You can use basic shapes like circle, triangle, square, rectangle to come up with simple drawings. The above illustration shows a Missy the Cat facing you and the other is Mister Rabbit with his back to you. 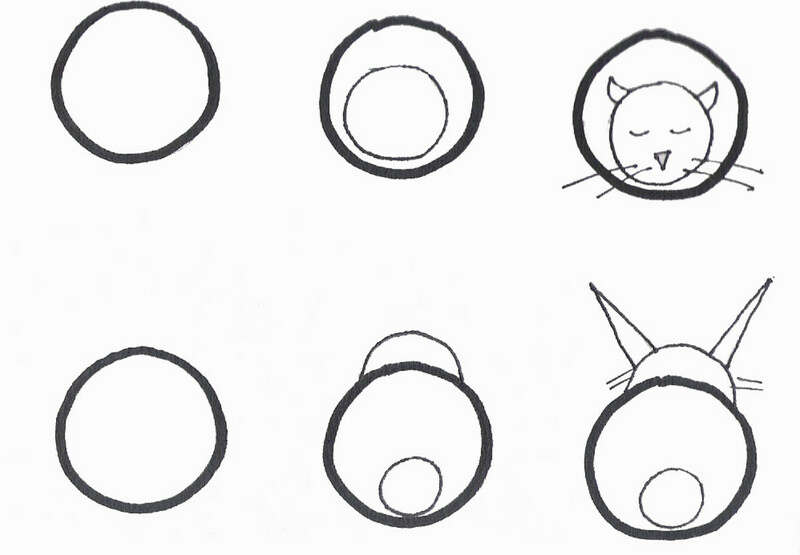 The Cat: Draw a circle. Add a smaller circle inside the big circle. Make sure the inside circle is placed near the bottom of the circle. Then you can add the ears, eyes, nose, whiskers and don't forget a tiny tail. Meow...Missy says "Be quiet. She wants to sleep." The Rabbit: Draw a circle. Put inside a small circle near the bottom and part of a circle on top. Add the ears making sure it’s pointed and long with whiskers. You’ve got a rabbit about to hop away. Run after him!!!! The Owl: Draw a circle. Inside the circle draw two smaller circles as the eyes. Place a large v between the two circles and a smaller v below. Fill in and complete as illustrated. The Clown: Draw a circle. 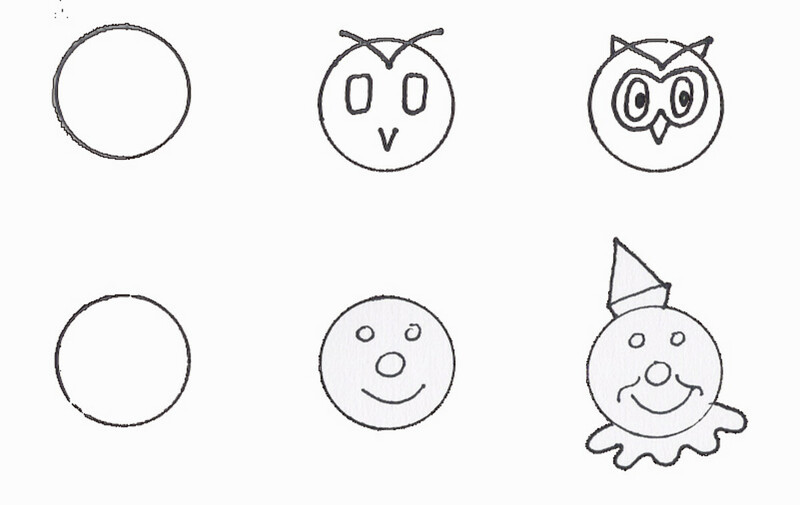 Draw two small circles as the eyes and one bigger circle as the nose. Now draw a curved line into a smile. Complete the face by adding a hat, a frill for the collar, laugh lines and you now have a happy clown. There are still many shapes which you can use to draw simple figures like houses, boats, doors, windows, tables and chairs. It's wonderful how several shapes join together can form things of many kinds. Another is the letter drawing. Using a letter, one can actually create something simple and cute. This can be done by older kids like the kindergarten students and up. Hey there's somebody watching on top of the hill! Mr. Bob looks handsome with his new suit. Aaawww aren't happy dogs just so endearing? I was very amazed that the letters could be made into certain figures. And so it is with numbers too. So here are some number faces that I enjoyed following. Now it's your turn to draw too. If you enjoyed this one, I'm sure your kids will enjoy learning how to draw as well. Just remember the drawing doesn't have to perfect. It is also the best way to cultivate love for the arts, perfect for bonding and quiet time with the kids! U have made nice pictures for kids. It is so to teach kids.I m glad to see this.Thanks. Hi. Can you make a number 2--dragon fly? Just like what you did with numbers 4, 6 and 8? Please? I'm gonna use it in my preschool class. Thank you. Great creative work and good ideas for kids! I enjoyed this wonderful drawings. this is an awesome work. 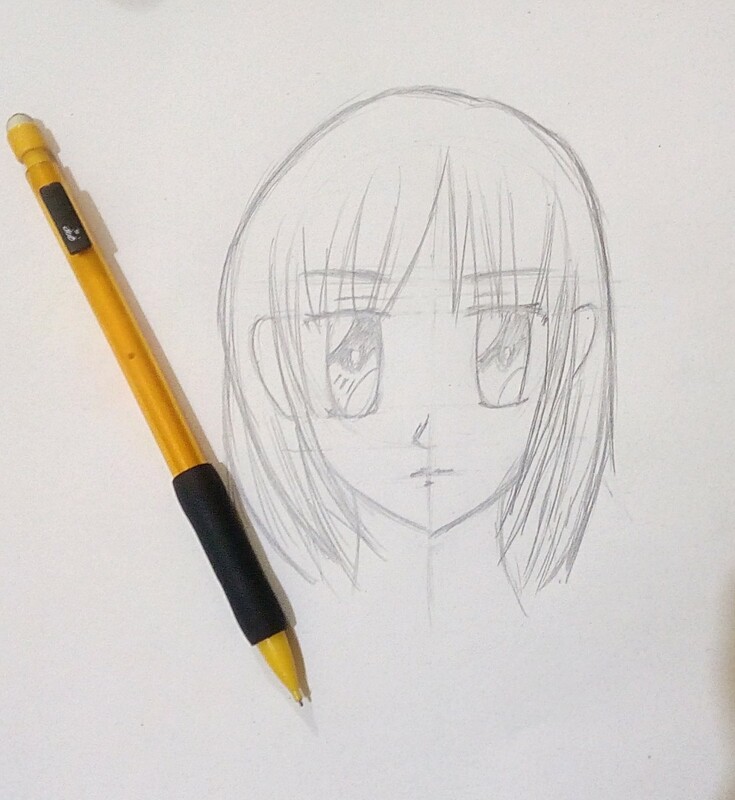 the whole process of drawing the eyes has been shown in simplified manner. These drawings made me professional! This is just the best..... I never thougt in dreams also that drawing is so easy. Thanks a lot for these wonderful drawings. This is where I will practice my drawing lessons. I think I could even learn to draw pictures this way. You know what they say, it's hard to teach old dogs new tricks. Lol. I love art of all kinds. Thanks for teaching us kids. I luv art.These arts are very cool! this is good how old is she ? great inspiration! will go a long way in helping with the younger kids in my art club. 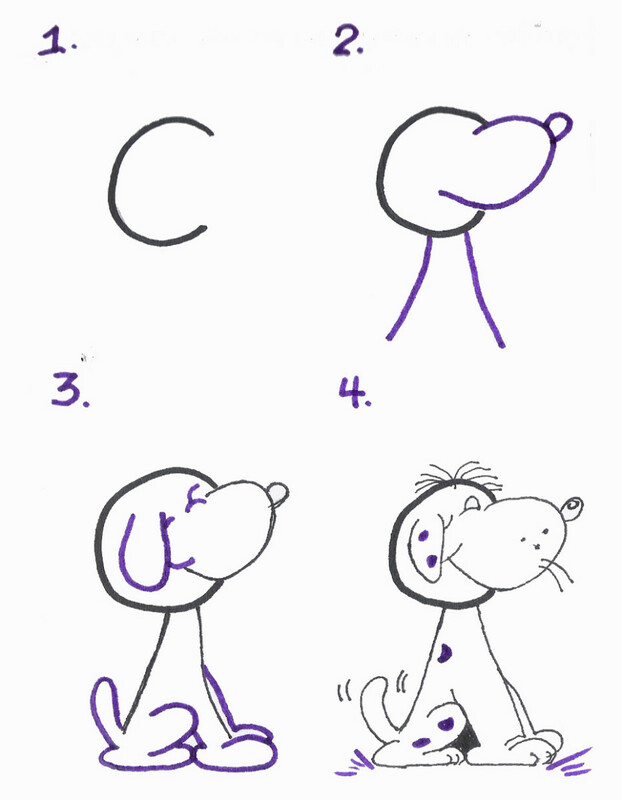 Its so important that children learn how to draw without stifling creativity. I've always enjoyed it whenever I had the opportunity to teach drawing to children. Kids are so appreciative when they learn something fun. You show a real knack for teaching art to kids. Thanks for this amazing post. NO one can ever complain that they cannot draw after reading this. Great hub ripplemaker. Ran across your hub. Love it. Drawing with my grandson (age 7), got me back into drawing agan. I missed it. Absolutely lovely! I'm so impressed. Even I can draw following your method - I'm sooooooooooooo proud of myself, thanks to you. Now I'm an 'expert', I can't wait to share my skills with my little girl. Thank you so much. Bspider, wow that is great and really interesting...best of luck to your endeavor! I really enjoyed your hub. I'm currently working on a web site that teaches math skills to children via comic books. At some point I plan to provide instruction on drawing as well. These are really simple and easy to follow methods for kids. I love those techniques you are shearing. This will add to my suns creativity for sure. Its charming to me. I am amazed with such a creativity that with alphabets you can draw a cartoon or drawing. Good keep your drawing skill sharp. Vizey: Are you ready to draw now? Have fun! :) Thanks for dropping by and enjoying this hub with me. One of greatest hubs I have ever visited. I can't even think that one can make a hub on this topic. Even Adults can learn drawing from your hub. The ability, and even better the love, of drawing is a great thing to encourage and foster in children. 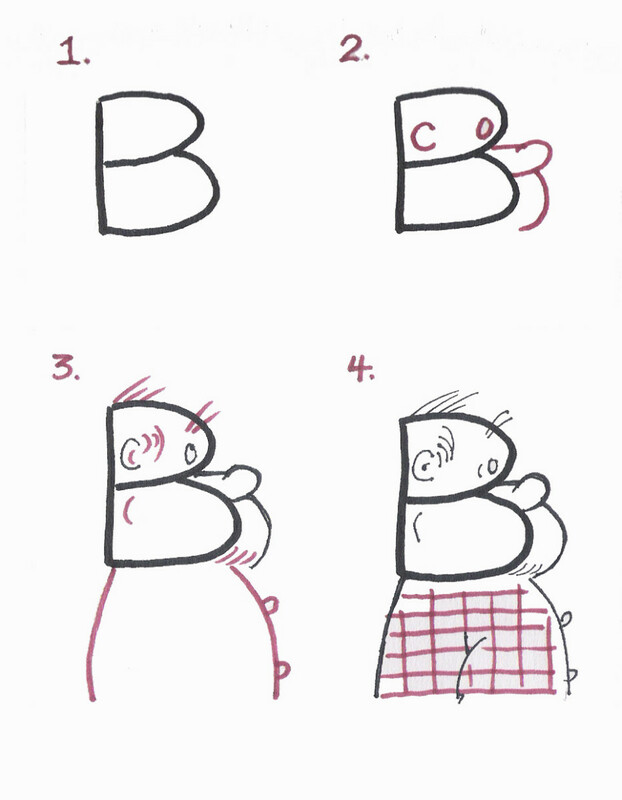 I've never seen using the alphabet and the numbers to be the base of drawing. This is very interesting. Maybe there is hope for me after all. Hi Shibashake, that books sounds very interesting. I should look for that. :-) Thanks for sharing and commenting on my hub. I appreciate it. This is very awesome. I used to love to draw when I was growing up. I didn't really have any teachers like you, so I would try to copy figures from my comic books :) I think that drawing is a very important part of human creativity and that it is useful for everyone - both kids and adults. Have you read Drawing from the Right Side of the Brain by Betty Edwards? It is very good. 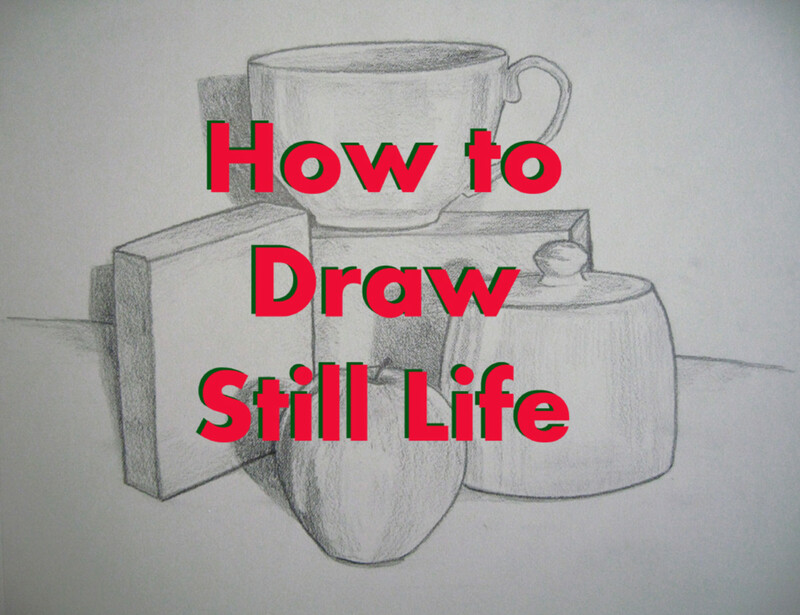 There are some really simple drawing exercises in there to help anyone get started with drawing. She actually gives seminars to a lot of business adults on how to encourage creativity through art. Hi wordscribe, nice of you to come by. That sounds like a marvelous idea. Hope your son will find this a delight. :-) Enjoy! This is a great hub, ripplemaker. 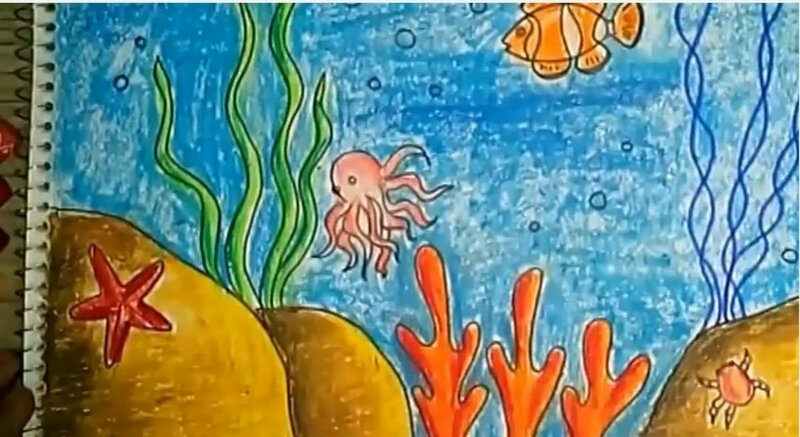 I need to spend some time with my son showing him how to draw, His sisters have a natural artistic ability and he gets very frustrated with his own ability. Art has been a great outlet for all of my kids. Thanks for the great hub. Hi Ripplemaker, ahaha I enjoyed this hub and trying them out on my own. Gee the wonders of numbers and letters turning into any figure. Thank you Teacher Michelle for another wonderful lesson. The child in me delights learning from you always in all ways. Hugs again and thumbs up! What a great hub - gives tons of ideas - lots I never considered lol and I used to stare at blank paper for hours coming up with ideas on what to draw. I'll just bet that the kids in your class LOVE YOU! 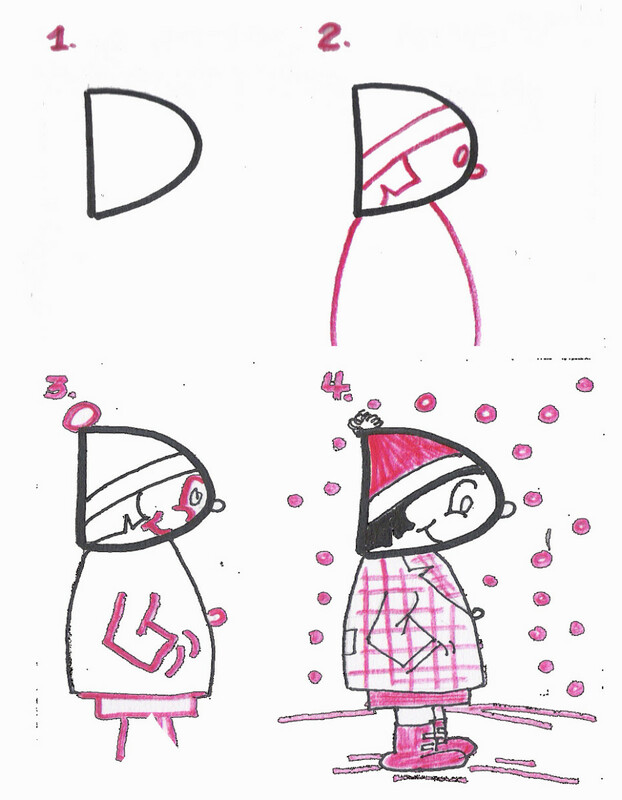 I still remember the stick figures my mother did when teaching my brothers and me how to draw. And yes...a plain piece of paper really brings out creativity and lets imaginations soar. A new box of crayons...always loved the smell! Great hub! This is a great hub, my son and I loved learning to draw, much better then we did before. Thank you! That's a great idea to start the kids off by the form of letters and numbers. I love the one with the owl. I normally draw a plain house by drawing a square. Then a triangle for the roof. And add a door, chimney, and window. I later added some flowers next to the house with a bee or butterfly by it. The other extra things I would add is the circle sun with sun ray lines sprouting out of it. Plus some puffy clouds. Aaaah...you get the picture. Hi Charia, you can print this out and have fun. Just right click the photo and save image as. Then you can print from there. :-) Enjoy the drawing. And thanks for dropping by twice. Hehe you are such a dear. As a child I remember the thing I use to draw the most was penguins on roller skates. This is an excllent how to. These are great. I might have to try them with my youngest who struggles in art. Very interetsting. I am not good at drawing. I wil do a print out for the younger ones. It is indeed a good `how to' hub. Thank you. Among hobby classes,art tops the list for most kids during summer vacation. Creation of interesting visuals is at once engaging,fun and refreshing. I am sure many parents will enjoy trying out all the above mentioned stuff in the hub with their kids. Thanks,ripplemaker for this hub. This is a fantastic hub. You are right about letting children express themselves...A blank piece of paper still makes me settle down! Using the letters and numbers is also a great way to teach the children to be more observant and look at details. Very good job here. Love this hub. Would love to be one of your students. Hi BC, Susan and I would love to have you as our student for art class! :-) LOL I am sure we will have lots of fun! Hi Hawkesdream, thanks for asking the question. Yes there is a book about it- the letters. :-) I will post the book above for referral. Hi Island Voice, I hope Keona will love this one. I get so amazed when kids produce such beautiful work. :-) It is truly inspiring. Drawing is always a great skill to encourage with young ones. I used to get the "how to draw" books from the library for my daughter before she started school. Not only did she learn to draw well but she made up stories along with her pictures. When she was in the first grade I bought a drawing kit from the learning express store where you draw and write a story. A company called Chimeric then takes the pictures and story and publishes it into a hardcover book. The book Tracey had published is called "The Greedy Sisters" published in 1996 and dedicated to her mom, dad, and brother! There is also a page in the back about the author Tracey Lynn Dillon, age 6. In ending it says "For fun, Tracey loves to eat cake and candy. She also loves to write and draw stories." It is sooo cute. Hey maybe this will make for a cute hub! lol. Thank you ripplemaker. I showed my 6 year old, your hub and he immediately tried drawing the pictures. He was very excited and he said "This is awesome!" It was very easy to follow. Fabulous! As an artist, teaching my 4 yr old granddaughter art is an adventure! She's gone from washable crayons, pastel to acrylic. She is so into it, we are so thrilled as a family. This is a wonderful, very useful hub, which i will be sharing with lil Keona. Where did you get the alphabet and number drawings from? Did they do the whole alphabet? Think it would be great for teaching 'the young one ' to spell aswell. Oh how fun. I am going to show this hub to my kids they love drawing! Thanks for sharing. I think all children should have art in their lives for a lot of reasons that include heart and soul as well as culture and expression. Not the most important reason is the fact that art and music prepare the brain to work with math and languages. I could babble on, but will only say that art ion one of my remedial classes we did for middle school youth raised their grade levels in writing and reading by 3-4 grade levels. It made brain connection and I am glad we were not too late. it is a SHAME that art has been cut from most of our local schools to "save money." Drawing pencils and thumbs up! This is really funny combination of writing and drawing. I like these ideas, letters/numbers just become alive. Hi, this is a really nice/fun hub. I'll need to try using letters and numbers to draw with my little ones; they love drawing and painting, it keeps them entertained for hours. Here at schools art is a big subject and from a very early age children are encouraged to draw and identify great painters. My daughter's classroom is decorated with Picasso, VanGogh and Dali's prints! Love this hub! I shall use this to draw with my grandson. He is four and just the right age to try the stick and crcle figures. Thanks so much!